Friday, August 10, 2018. Morning Benguet. I already enjoyed in there. This was my fourth observation and my last observation because i had to practice teaching on next week. That day, I will observed four classes, that were 9-3, 8-2, 9-2, and 8-1. After we joined on flag ceremony, I and Ma’am Rose went to grade 9-3. Ma’am Rose asked two students to write the solution of the last assignment. She gave a problem to show the topic of that day. The topic was about factoring quadratic equation. 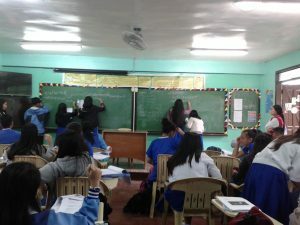 The beside class (Grade 8-2) was very noisy while the lesson going on. So, Ma’am Rose chew out them to be quiet. As good teacher, she already tried to made conducive atmosphere for learning. A half of the meeting was used to discuss about class management. You already knew that Ma’am Rose was a adviser of grade 9-3, right? 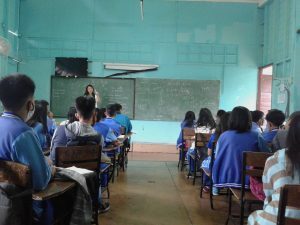 They discuss about class motto less than six words, bulletin board for schedule, announcement, classroom officers table, project, assignment, seat-plan), subject areas, and theme of lockers. Next, we continued on grade 8-2. The first activities were cleaning the class and fixed their seat. 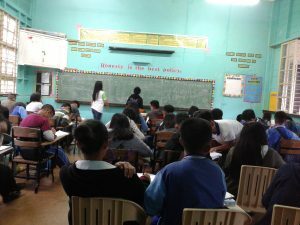 I thought that they haven’t ready to learn math, because mostly students just took their module on locker when ma’am rose asked them to open their module. Some students wanna be volunteers to write the solution of their assignment about foil method. Next, Ma’am Rose wrote the formulas of the product of the sum and the difference of two binomial and the square of the sum or the difference of two terms. She explained very well. I like her voice when she taught, aloud and clearly. In the grade 9-2, I saw the seat-plan of them. The seat-plan was creative, it was boy-girl-boy-girl like that. The topic of that day was factoring by grouping. And the last observation was in grade 8-1. The students be quiet when the teacher came. After routine activities, they were divided to some group based on their row seats. Then, every group chosen delegate to write the solution of their assignment in the board. They worked together to write correct solution. They were given individual and team score. They continued with some problems. Ma’am Rose gave a assignment for them. After that observation, Ma’am Rose and I discussed about our schedule for next week. She explained the subject for my practice teaching section. I went to Kenwayne with Rina and Putri. That was my first time. We walked and used umbrella, because the rain came again. Hehehe I was very surprised. I thought, mostly people in Benguet use public transportation. I only saw a few motorcycle (i can count it with my finger hehehehe) Yeah. Most of them liked walk by foot. That was difference with my habit on my country. I always used my motorcycle to going anywhere. And the good thing of Benguet that the driver will stopped their car if the people were crossing the road. That was difference with our country, sometimes we was afraid to cross the road because so many motorcycle and other transportation with speed velocity, though I was on zebra cross. Hehehe. In the grocery, I found several products that I also commonly found in Indonesia, for example Downy, Puff Rice Cakes (Jipang), Ajinomoto, Energen, etc. After in the dorm, Andyta showed yakult light with a blue package. We have never found before. 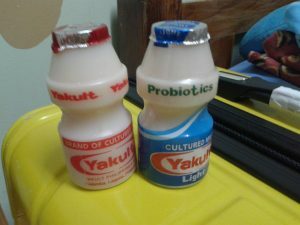 Yakult Light provided the same benefits as Yakult, but is a lower sugar option. Frankie brought SamYang and Kimchi for us. I and Risal learnt to sing ‘Lupang Hinirang’. Sam and Frankie helped us. 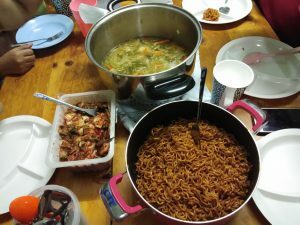 Then, we and the buddies cooked SamYang and soup. 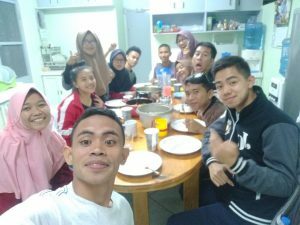 We had dinner together.